The Palo Alto Duck Pond is a noisy place. There are dozens upon dozens of ducks, seagulls, coots, and geese all making a royal ruckus in the early morning hours. They are used to having people around, and are bold enough to let you walk past without scampering away in fear. The Pond attracts all manner of non-shore birds as well – from ululating pigeons and chirping finches to lovely red-winged blackbirds. The cacophony is quite incredible and somehow reassuring especially if you have had four hours of sleep and have woken up early Saturday morning only to discover that your birding trip got canceled without notice. But there is an altogether different sound that was coming from the far end of the Pond, where there is a small grove of palm trees. As you approach the palm grove, you can hear a comical sequence of low-frequency groans, croaks, and moans. It goes on endlessly and is just so queer that the few birdwatchers near the grove could not keep the laughter off their faces. 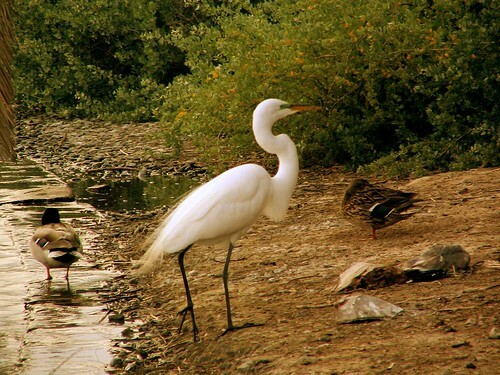 This is the realm of the herons: Great Egrets, Snowy Egrets and Black-Crowned Night Herons, and they are nesting at this time of the year. They are also making a lot of noise, and fighting with each other for space. I had never heard a heron make a sound before, and was surprised to see that such an effortlessly graceful species of bird has such hilariously awkward speech. The Great Egrets were the fewest in number and perched on the highest branches. This one (below) was building a nest. It came down for a drink, and shortly after, grabbed a very long twig and went back up the trees. 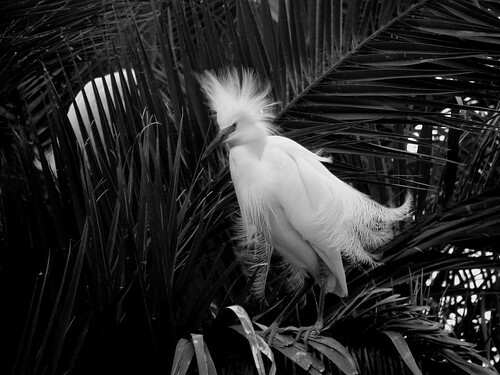 The Snowy Egrets were more numerous, more quarrelsome and more ostentatious in their displays. Here is one, for example, all aflutter in the breeze. 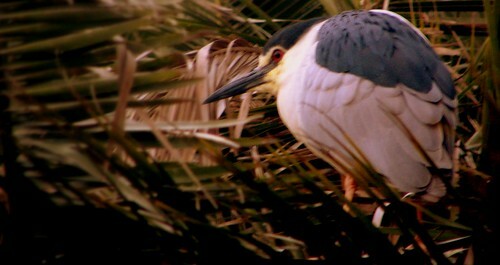 The Black-Crowned Night Herons were the quietest. There were fewer of these and they probably recognized their place in the hierarchy, settling down on the some of the lower branches of the canopy. Like a lot of birds, they puff themselves up and bury their necks in their feathers. Seeing a bird puff up always reminds me of my own pet birds. We had a ill-tempered parakeet that never learned to say a word but delighted in biting your fingers off. Later, we kept four budgerigars and loved them to bits, but they all got sick and died one after the other. There were no pets in the house after that. The herons will lay eggs soon. I want to come back often because, unbelievably, this place is only a fifteen-minute drive from my apartment. I just wish I had a more powerful camera and about 6 extra hours per day. Thanks BL. For me, the best part of the experience was listening to the bird calls. I wish I had something with which to record the sounds and put them on the blog using the Odeo plugin. Tai, thanks so much for the link. 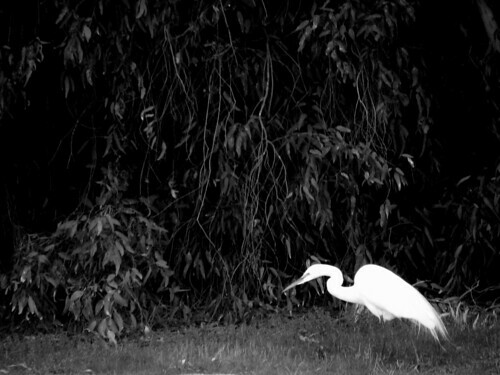 The site is great (I checked the Egrets page). I’m at work now but will add a link to the site in the body of the post when I go home. You are a fantastic photographer! Stefanie, thanks! That makes my head swell ;). I try to do my best though, truth be told, the full-blown versions of those photos don’t look very good. When flickr subsamples them, it probably applies some sophisticated interpolation and sharpening so that some of the imperfections are removed. Part of the problem is that I haven’t figured out the manual mode of my camera yet, and part of the problem is that a 3 Megapixel camera with 10x zoom is far from ideal for bird close-ups. These are beautiful. There are herons in the estuary I live right next to; they’re a delight to watch. The best to you and this blog. I look forward to dropping by again soon!